If people knew grep, sed, and awk, there wouldn’t have appeared many good and beautiful programs. Let’s face it, after 9 years on linux exclusively, I feel helpless in windows. Navigation, search, editing, and processing files is very easy and natural in unix: you may know just few commands, and the way to build pipelines out of them. Fortunately, I remembered that I used to utilize MSYS in the past. So I tried to install it this time. Surprisingly, it comes with famous pacman as a package manager. 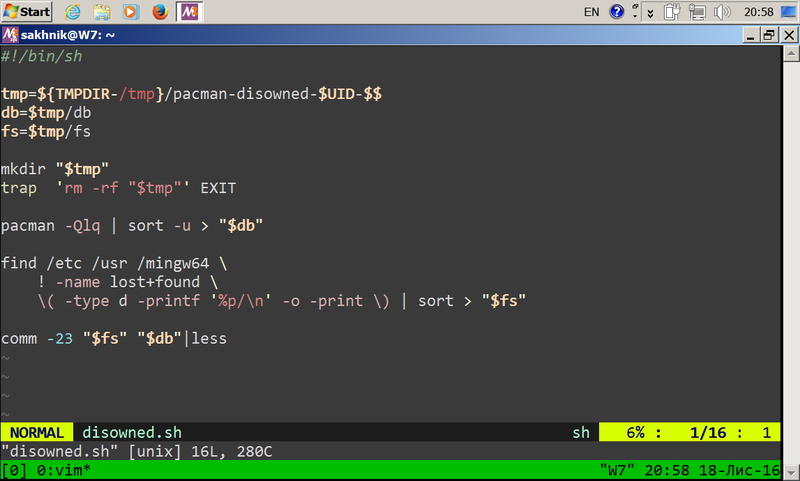 So finally I felt like home: zsh, tmux, mc and vim are available in their repository and practically work like in linux. I had to abandon QEMU KVM, because apparently VirtualBox handles MSYS’s mintty much better.